When I started driving for Uber and Lyft a couple of years ago, having the right dashboard mount for my phone quickly became a critical task. I keep two iPhones in constant use and they needed to be easy to reach and securely in place. Having your phone tumble to the floor while you’re in heavy traffic and trying to follow GPS routing can be alarming. That’s why I was skeptical about using a magnetic mount. 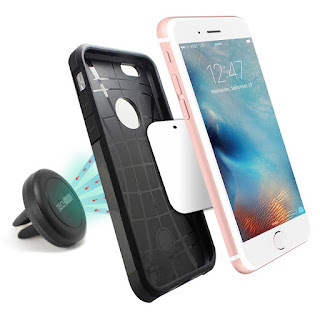 Would the magnetic keep the phone in place while I repeatedly tapped and swiped? The answer is an emphatic yes. I’ve been using two TechMatte MagGrip mounts for several weeks and I couldn’t be more pleased. The MagGrip attached firmly to my dashboard air vent and and the magnet keeps the phones solidly in place while still being easy to remove. No more prying the phone out from the clutches of a spring-loaded mount. The MagGrip system requires the use of a thin metal plate for the magnet to grab. For one phone, I attached the plate to the back of the phone’s protective case. For the other, I slipped the plate inside the case. Both approaches worked perfectly. This is not only the most convenient phone mount I’ve ever used, and I have tried at least a dozen, it is also the least expensive. I don’t know how you beat that combination. The mount sells for $6.99 on Amazon.